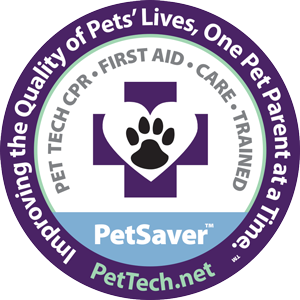 PHX Animal Behavior Center is now offering Pet CPR and First Aid courses with Carrie Seay. She is a certified Pet Tech® instructor as well as one of our head trainers and owners. These courses are wonderful for pet parents and pet professionals alike as they will teach you what to do in an emergency before you are able to get your pet to the vet. Premier 8-hour class including CPR techniques, first aid skills, dental care, senior care and health & wellness information for dogs and cats. Additionally, the class includes our PetSaver™ 40-page handbook and upon successful completion, each participant will receive a certificate and wallet card. Sometimes the unexpected happens. Will you be prepared to take action when it does? 5+ hour class including CPR techniques, first aid skills, health care and wellness information for dogs and cats. Does not include dental care or senior care. Additionally, the class includes our PetSaver™ 40-page handbook and upon successful completion, each participant will receive a certificate and wallet card. Sometimes the unexpected happens. Will you be prepared to take action when it does?